Puketui Valley Road branches off Morrison Road, which connects with SH25 near the turnoff to Pauanui, and near the junction of SH25 and SH25A. 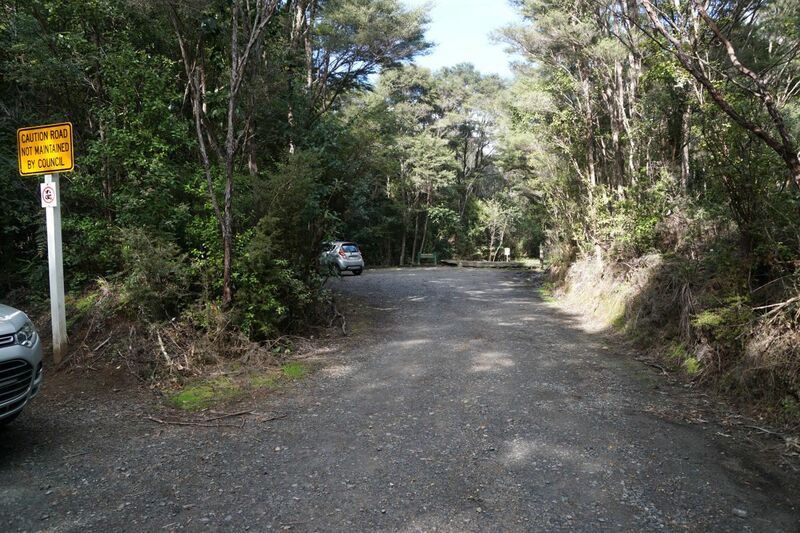 The last couple of kilometres of Puketui Valley Road are gravel and very narrow, with the Tairua River on one side and steep cliffs on the other. 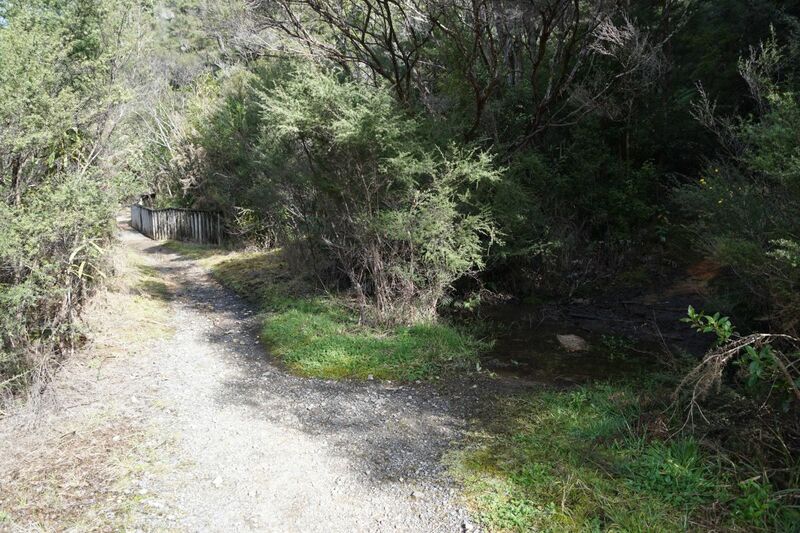 A couple of tracks are accessible from the bridge carpark a short distance from the end of the road, with most tracks accessible from the carpark at the end of the road, next to the DoC campground. 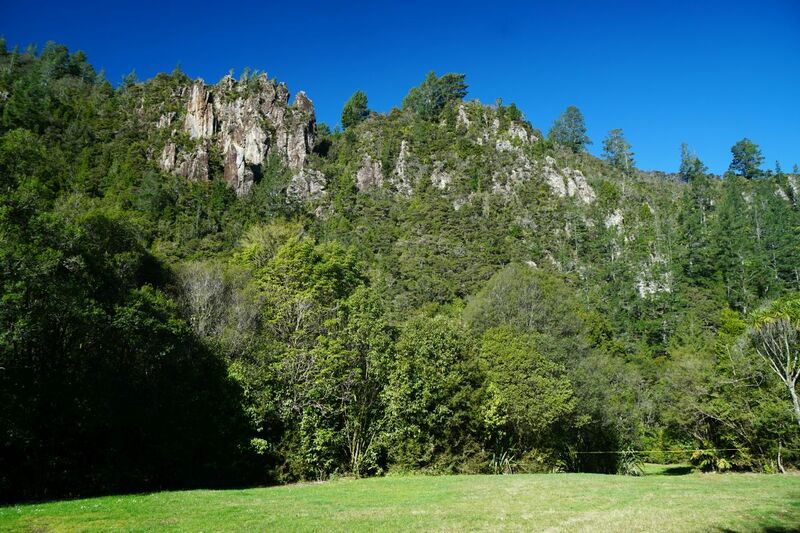 Descriptions of the walks are available on the DoC web site, and a link to a downloadable Kauaeranga Valley and Broken Hills brochure and a Valleys of Gold walks brochure with more information is available on the same page. 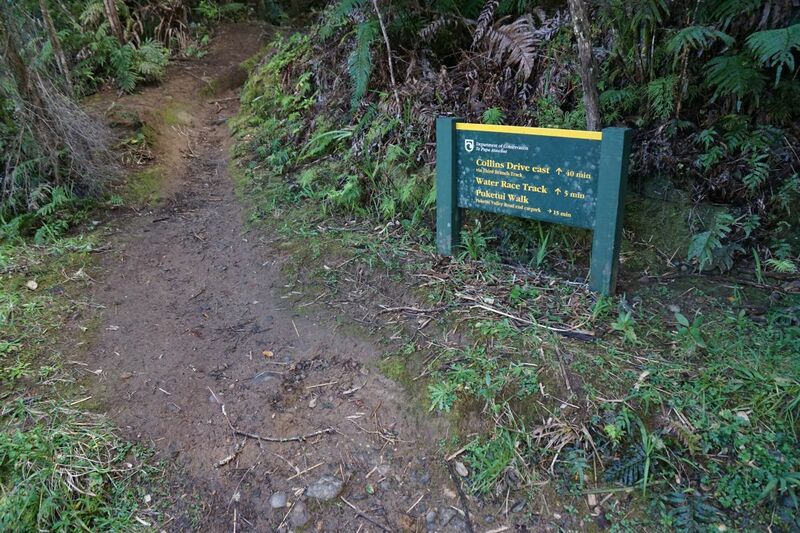 The walks are classed as easy walking track, some parts are quite steep, although there are no serious stream crossings when starting from Puketui Valley Road. Basic DoC toilets are accessible from the carpark and from the campground, but there are no other facilities on site. Open fires are not permitted, and dogs are not allowed. 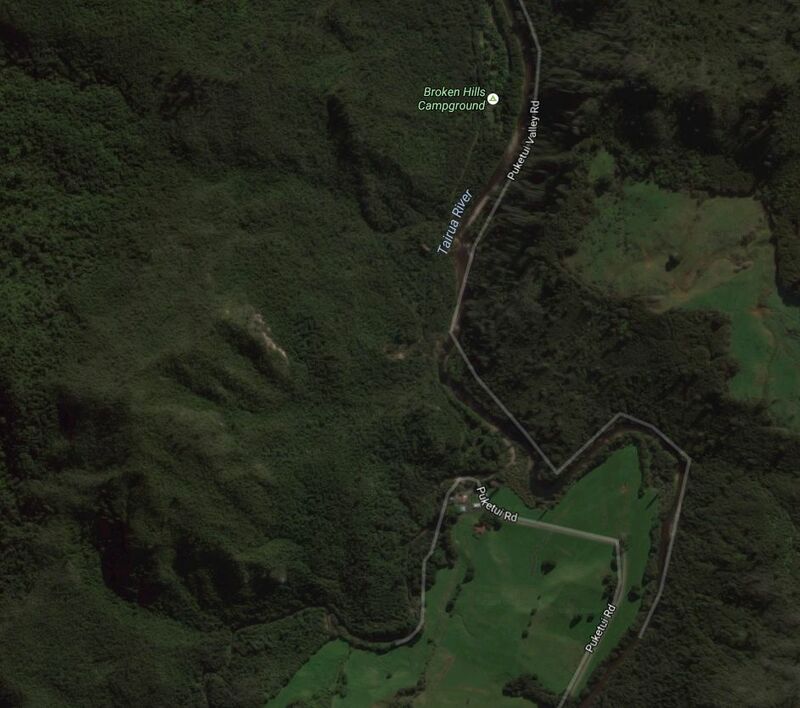 Google maps shows an incorrect location for the last part of Puketui Valley Road. 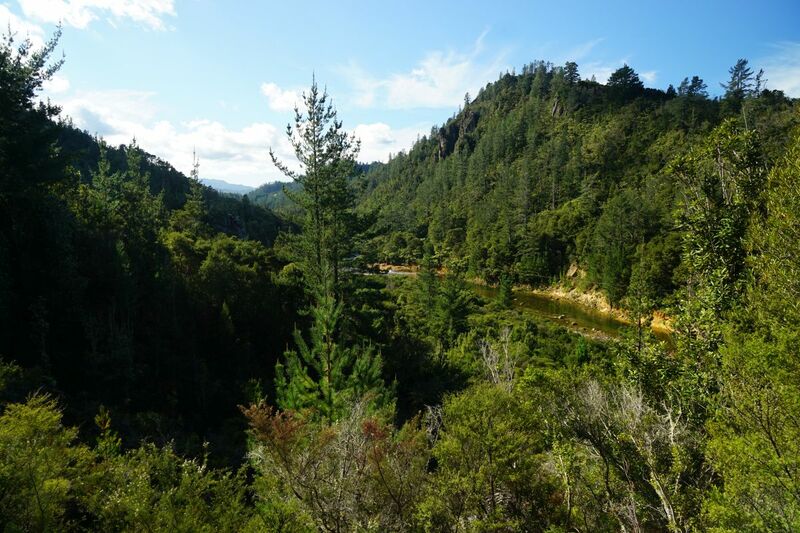 The road crosses the Tairua River about 500m north of the campground, and continues on the western side of the river, ending a few metres past the campground. Carpark to Government Battery along Puketui Walk. 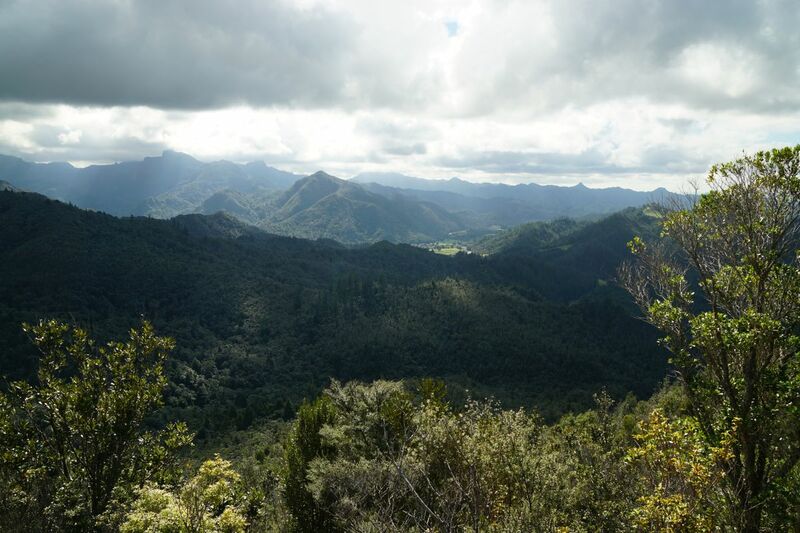 Main Range Track from Puketui Walk to Lookout. Lookout to West End Collins Drive. Collins Drive to Third Branch Track. 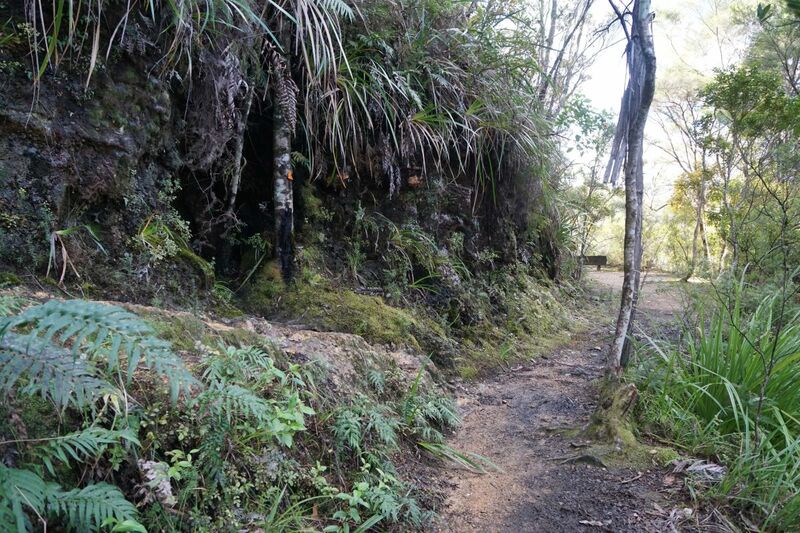 Third Branch Track to Puketui Walk. 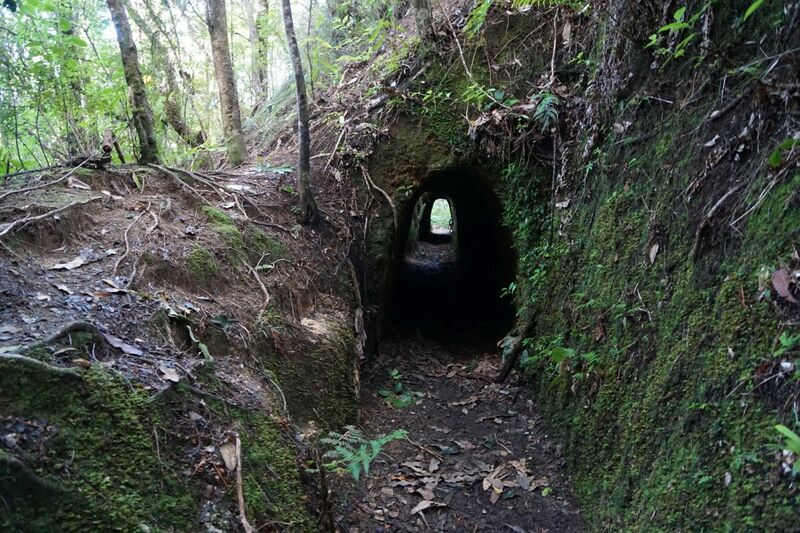 Puketui Walk to Main Range Track. Water Race Track from Main Range Track to Water Race Link Track. 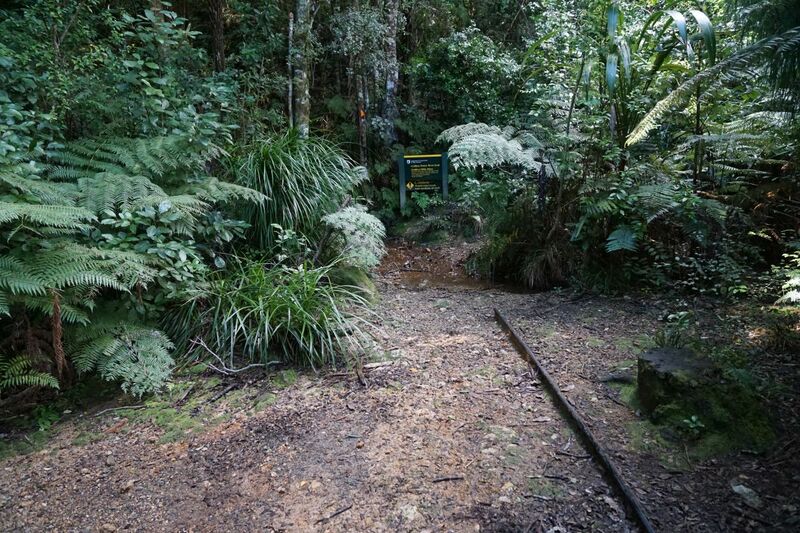 Water Race Link Track up to top of Third Branch Track and back down to Puketui Walk. Puketui Walk back to carpark at the end of Puketui Valley Road. 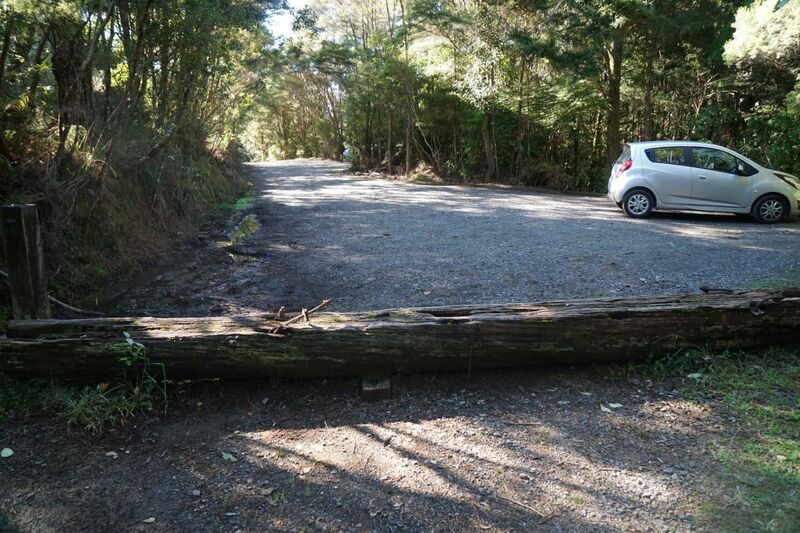 No attempt was made to cross the Third Branch Stream to Puketui Roadend Carpark. Total distance walked was about 7.2 km, with a total time of 3 hours 35 minutes, including a break of about 10 minutes at the West end of Collins Drive for lunch. 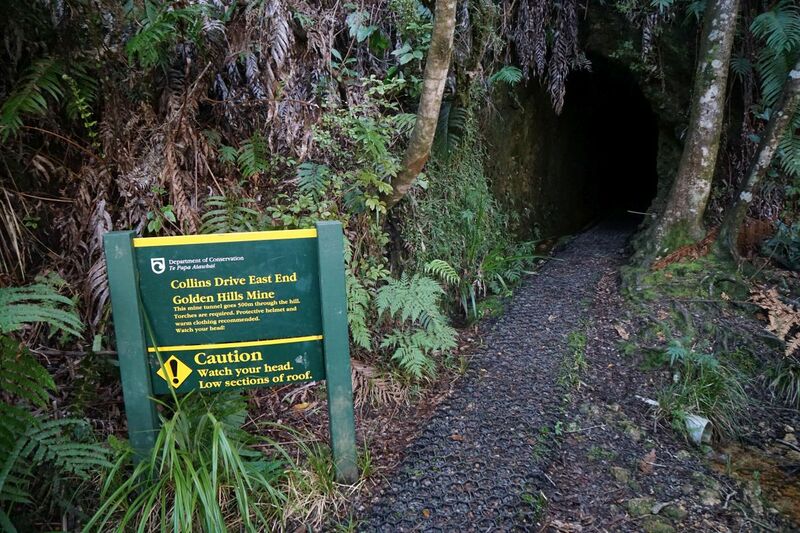 A good torch is required to walk through Collins Drive, a 500 metre long tunnel. 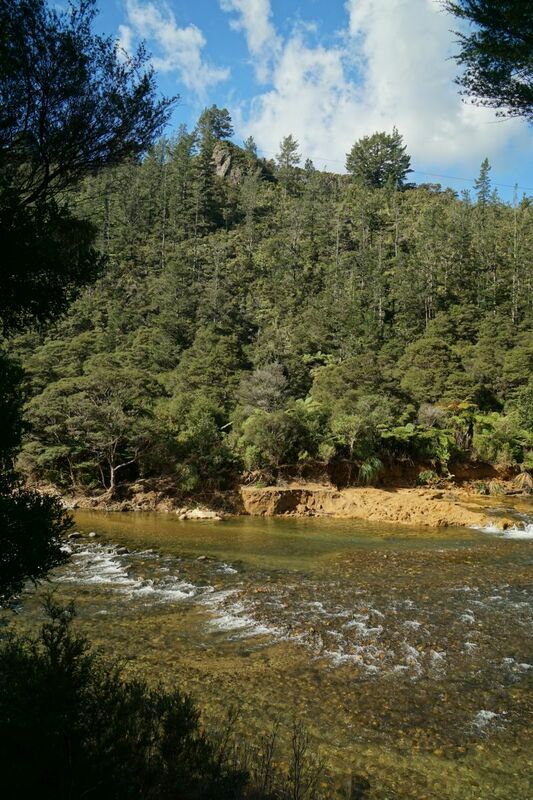 Bluffs visible across the Tairua River from the DoC campground. The carpark at the end of Puketui Valley Road. 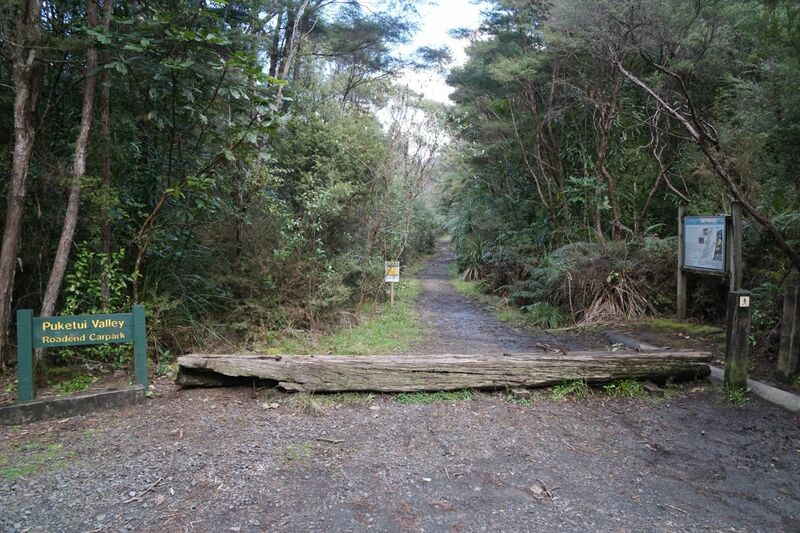 The start of Puketui Walk, seen from the carpark. The short track in the foreground on the right to the site of the Government Battery is not signposted. Across the bridge in the background is the start of the Main Range Track. The only remains of Government Battery is a flat concrete pad. 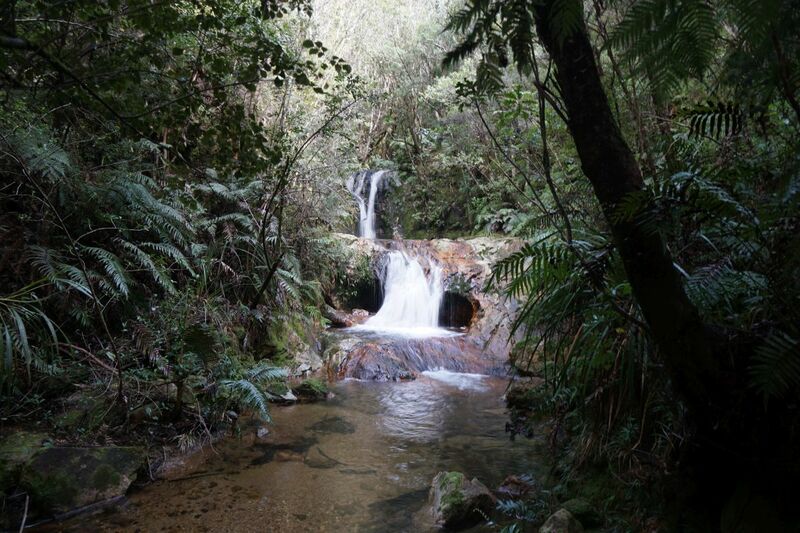 A small waterfall and a pool are accessible from the battery site. 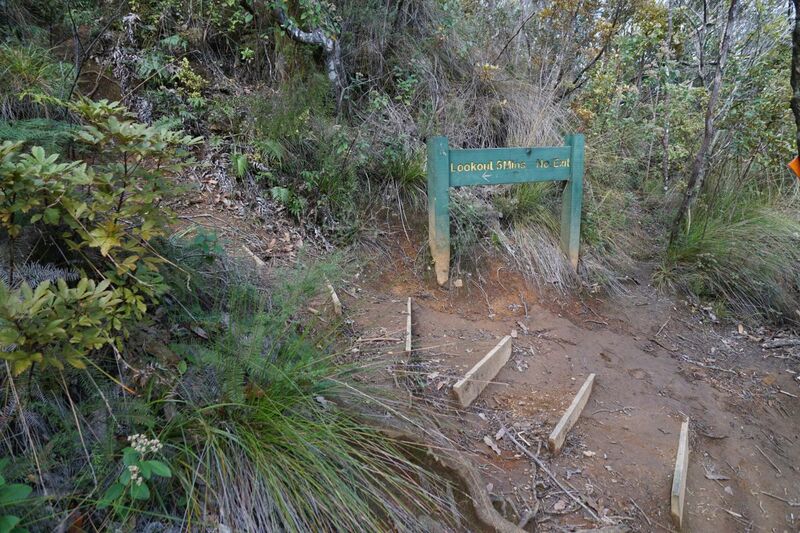 Although not signposted as such, the start of Main Range Track branches off Puketui Walk here. 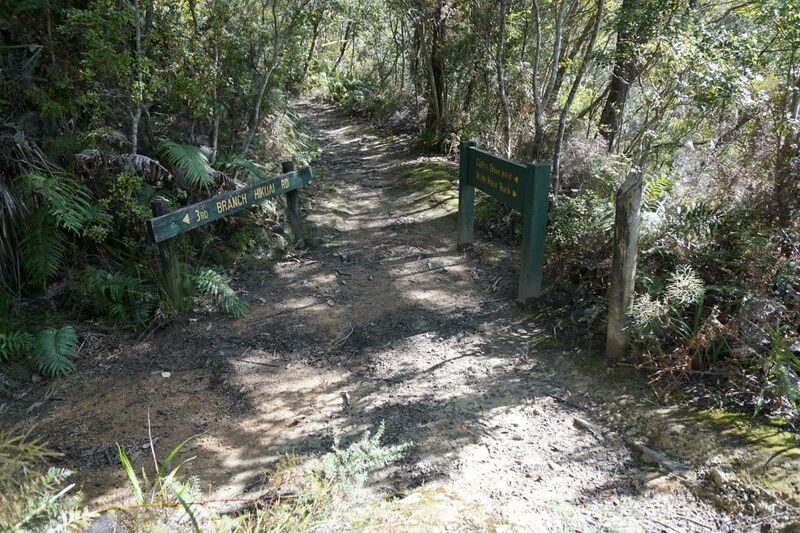 Main Range Track continues on to Paton Stream Dam and further into the forest park. 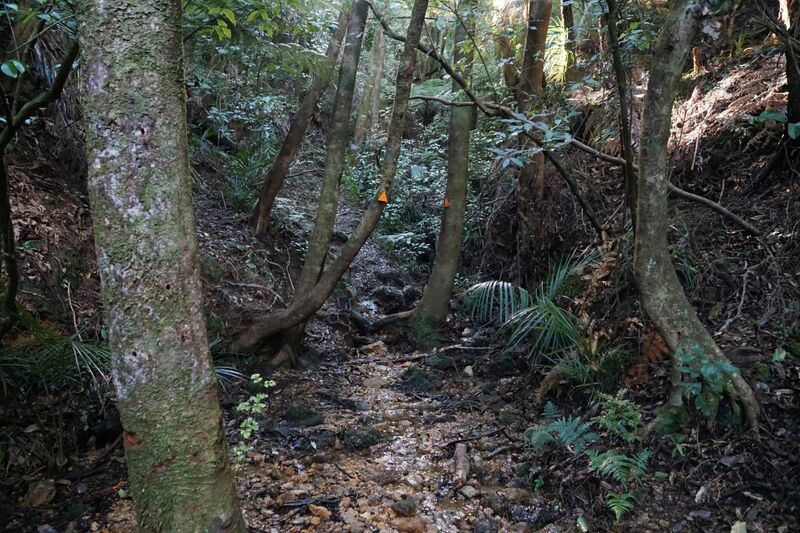 Water Race Track branches off to the left from Main Range Track about 140 metres from Puketui Walk. 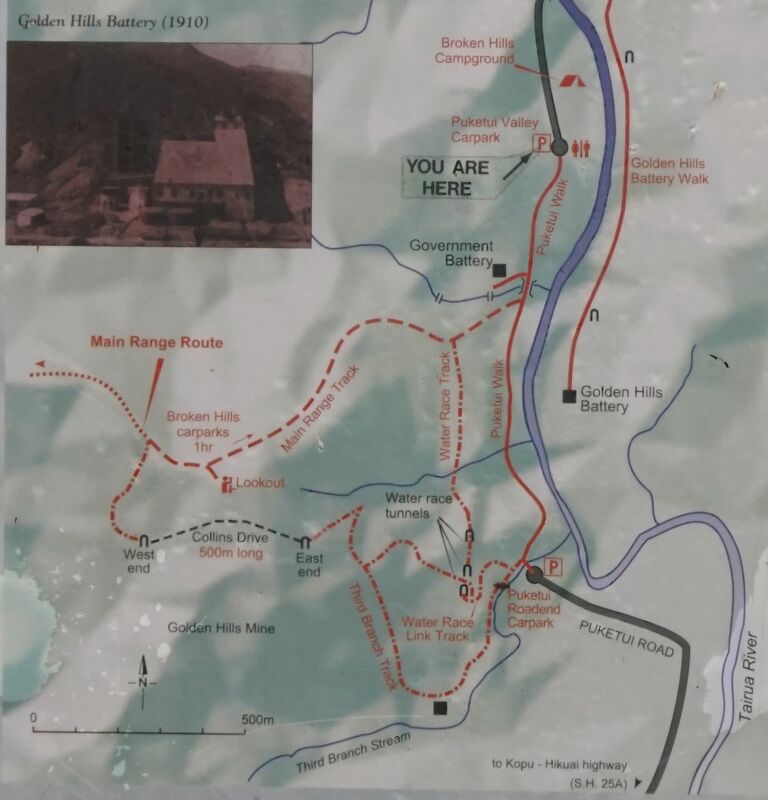 Main Range Track is a fairly regular but quite steep climb, starting from about 40 metres above sea level, and up to the short side track to the summit at about 300 metres asl. The summit is marked as 322 m asl on the topographic map. Main Range Track continues down to the right, with the track to the lookout up the steps to the left. 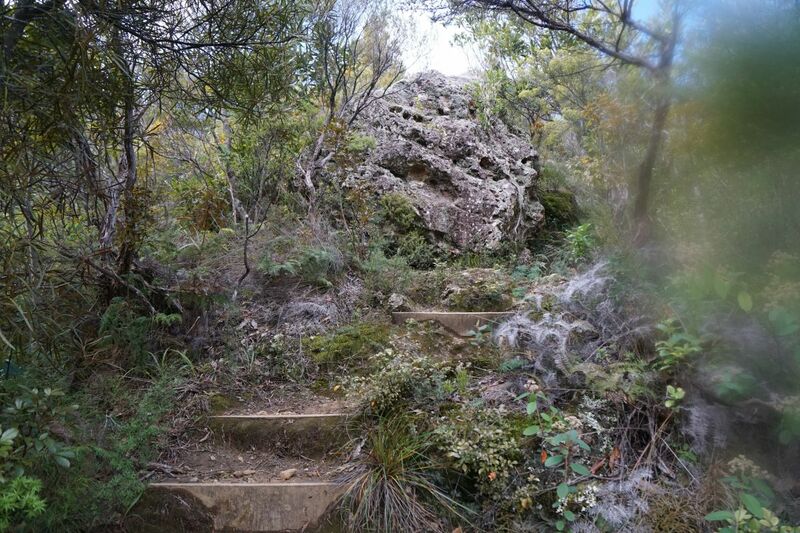 A rocky outcrop near the summit. Views of the surrounding forest park from the summit. Another 110 metres or so along Main Range Track from the summit access track the Main Range Track continues on to the right, with the Collins Drive access track leading to the West End portal branching off to the left. 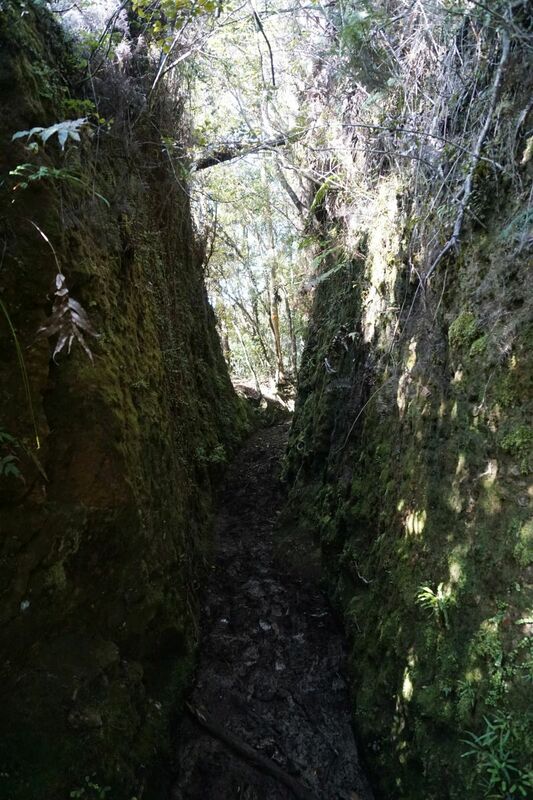 The track to the portal follows a small stream down the hill. A small clearing marks the western portal of Collins Drive. 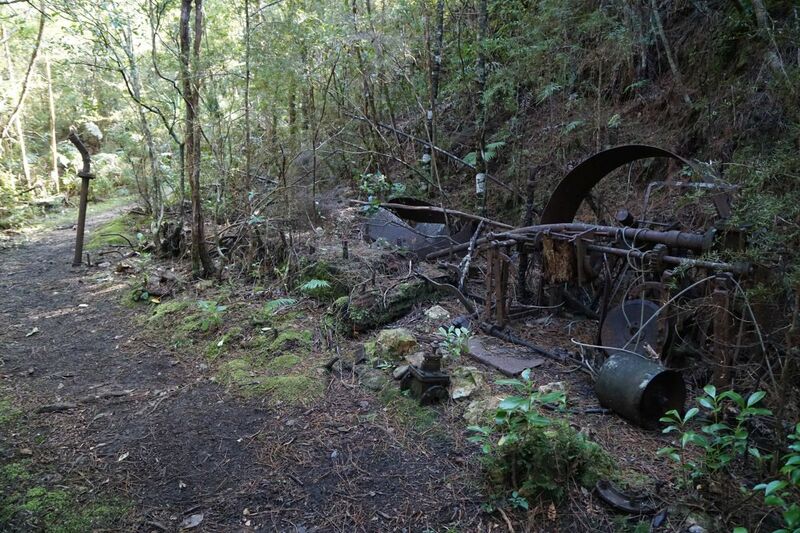 Old tramway tracks, presumably used in the Drive, can be found here. The West End entrance to Collins Drive. 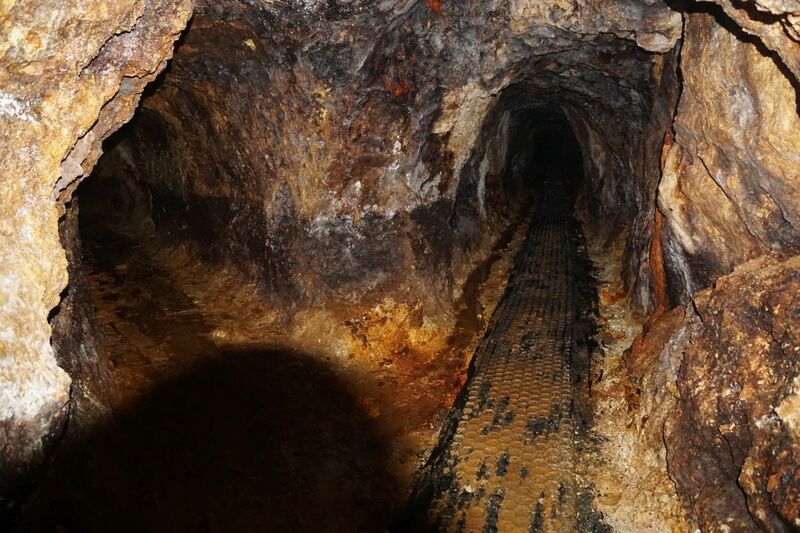 Note that a good torch is required, as the tunnel is about 500 metres long, narrow and with a low roof in places, and with a bend about halfway along so both ends are not visible at the same time. Water drips from the ceiling, so warm clothing is recommended. The sign advises the use of a hard hat. A rubber mat floor is provided through the main drive. Some drives off the main drive are blocked off, but two others are open. However, no attempt was made to enter either of these. The East End entrance to Collins Drive. The drive exits on a steep hillside. A track leads down from the East End of Collins Drive to Third Branch Track and Water Race Link Track. Boardwalks or bridges cross some of the steeper sections. The track leading up the hill on the left is the track to East End of Collins Drive. There is another drive into the hillside at the start of this track. The short track ahead to the right leads to a sign marking an aerial ropeway. The track at picture bottom leads to Third Branch Track and Water Race Link Track. The sign indicating aerial tramway ore hopper. No hopper is visible, but an unmarked track with steps leads downhill on the far right. This track is not marked on the maps, and no attempt was made to follow it down the hill. The track (straight ahead) is fairly level until it reaches the junction with Third Branch Track (on the bottom left) and Water Race Link Track (picture bottom right). 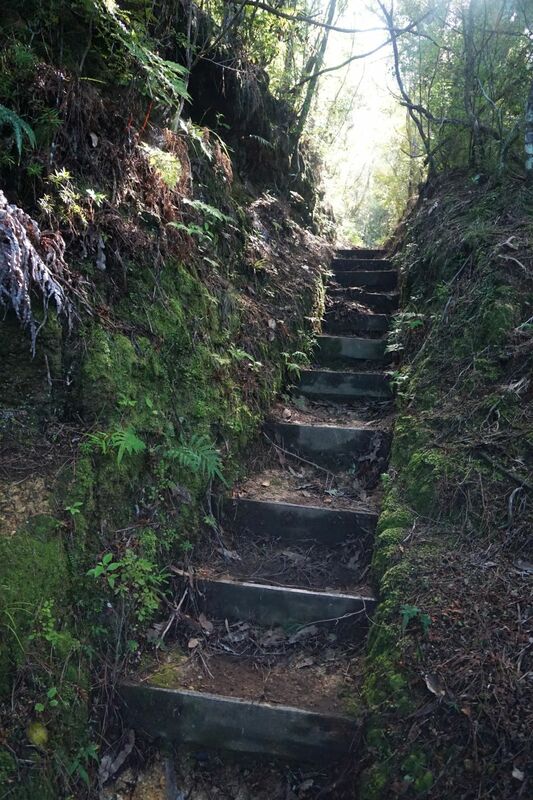 The Third Branch Track is quite steep, with numerous steps. 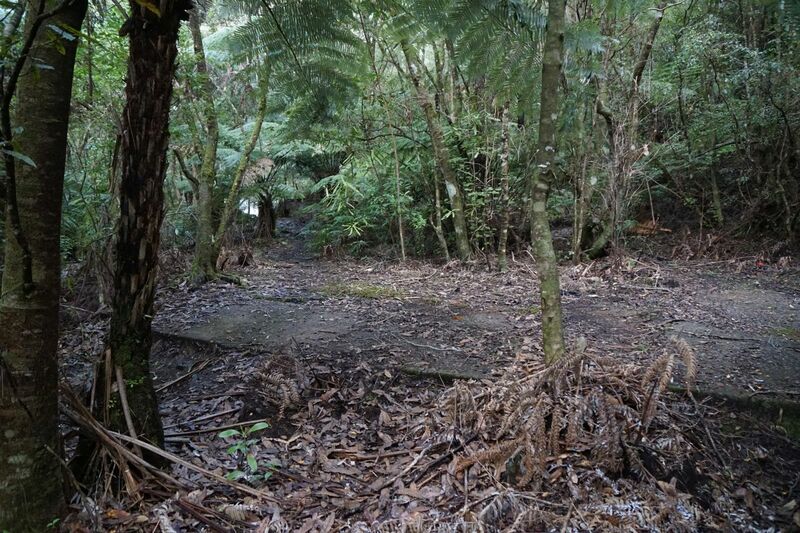 Remains of the battery on the Third Branch Track, at the bottom of the hill, adjacent to Third Branch Stream. The cylinder at bottom right is one of the stampers. 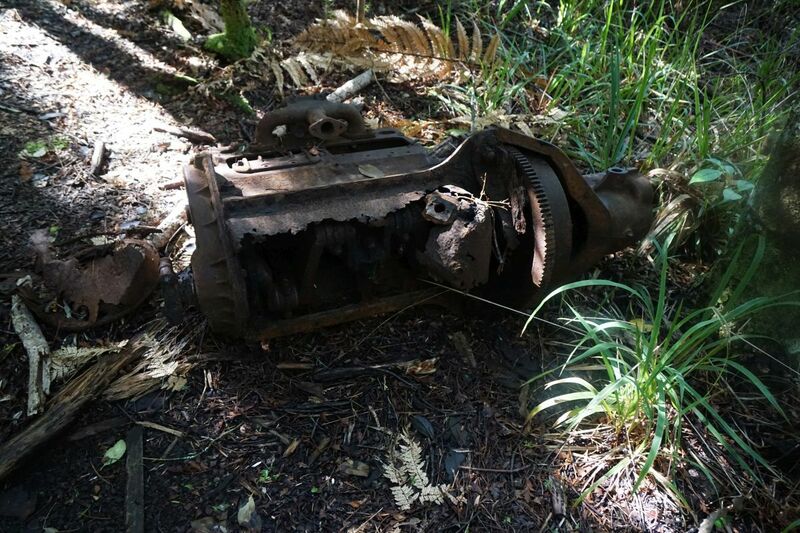 And nearby the remains of a side-valve engine. 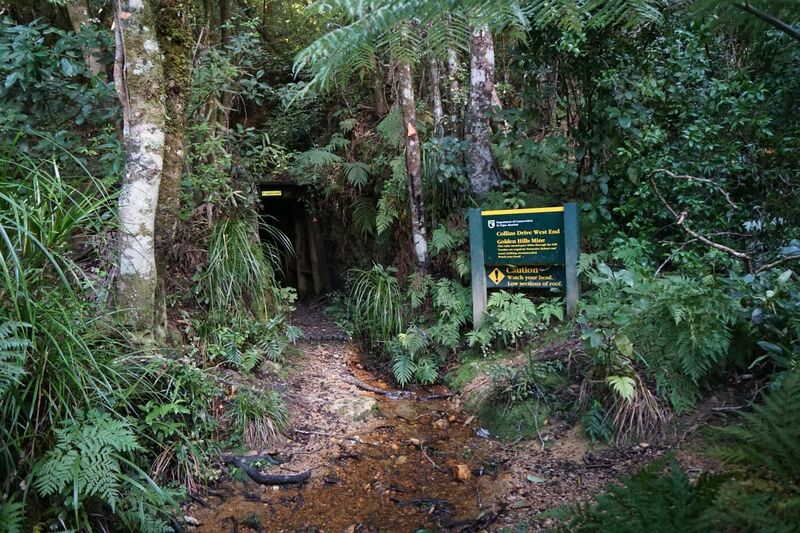 The Third Branch Stream runs alongside Third Branch Track between the battery and Puketui Walk and Water Race Link Track. 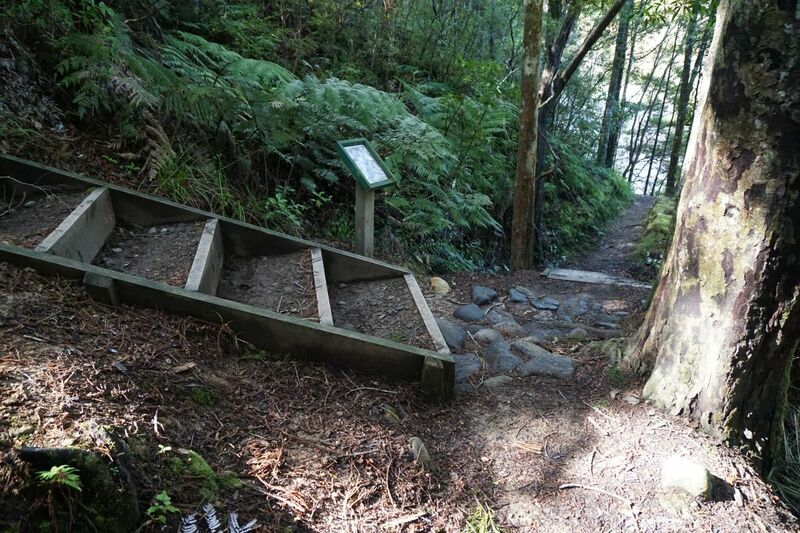 The steps are the start of Water Race Link Track, with Puketui Walk ahead to the right. 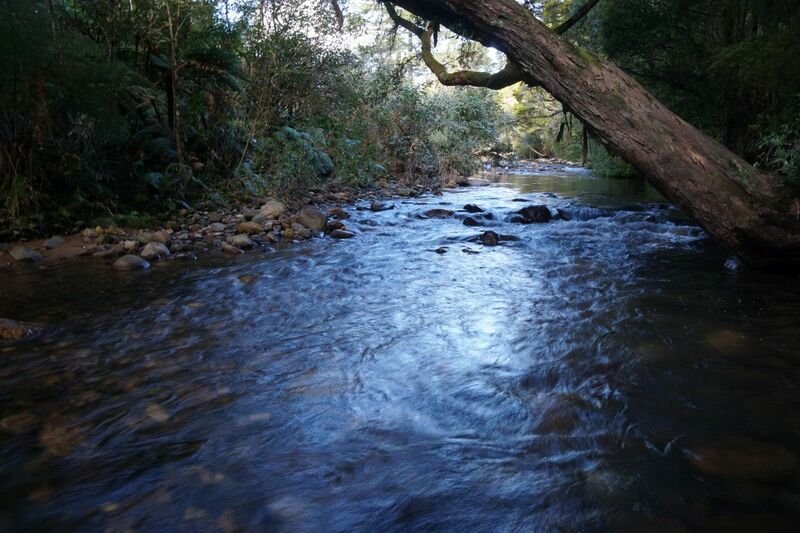 Third Branch Stream has apparently once been crossed by a ford, joining Puketui Road and Puketui Valley Road. 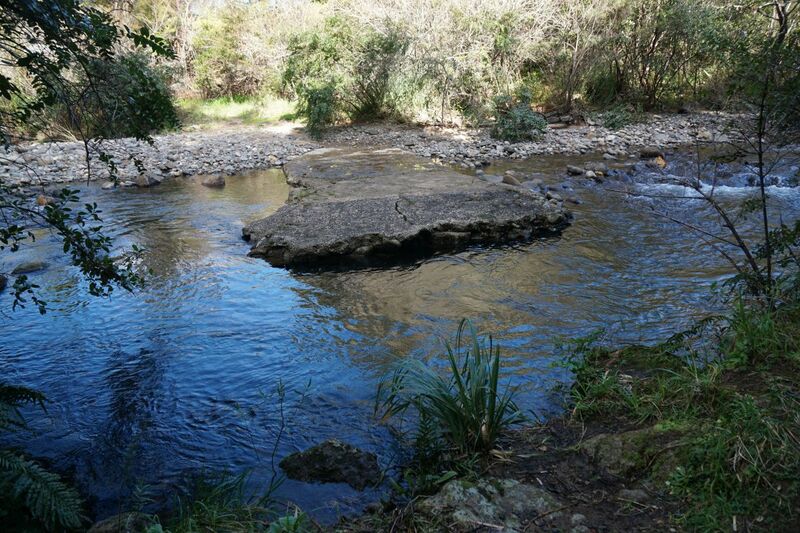 Puketui Road end is on the opposite side of the stream, but the crossing now would best be done either above or below the remains of the ford. The stream is deep and fast running through the gap. 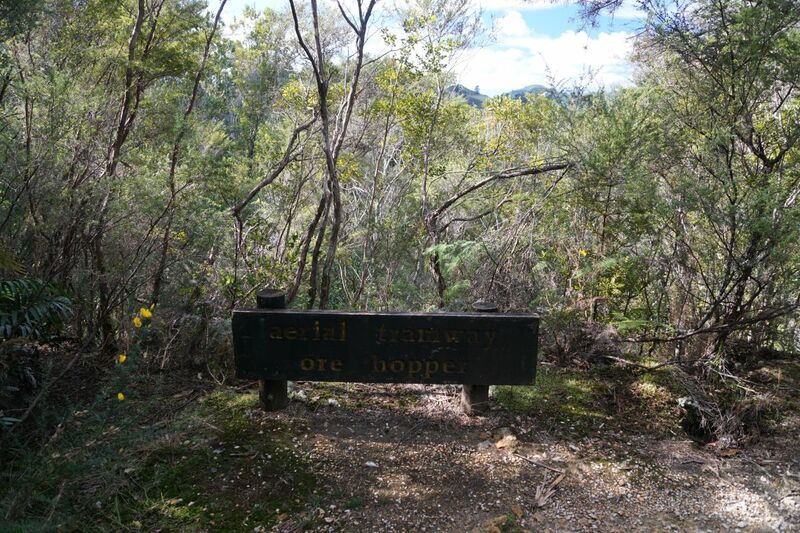 The DoC sign by the stream crossing, intended for those who start the walk by crossing the stream from Puketui Road. 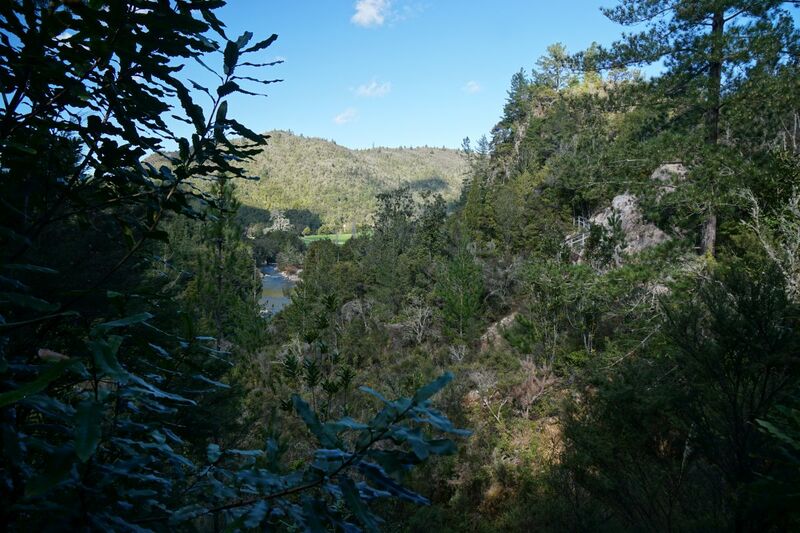 View across the Tairua River from Puketui Walk. 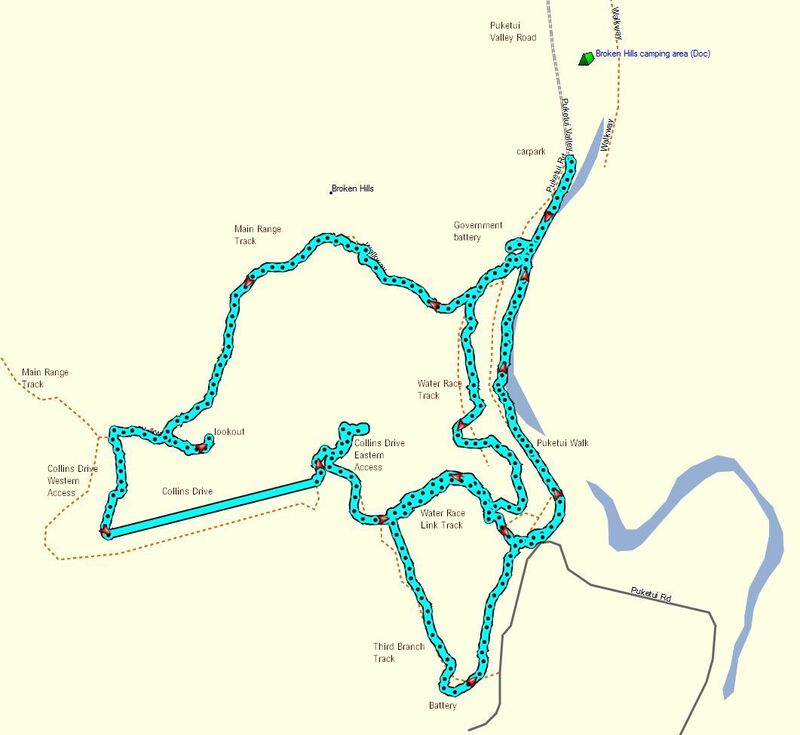 The Water Race Track runs between Main Range Track and Water Race Link Track. 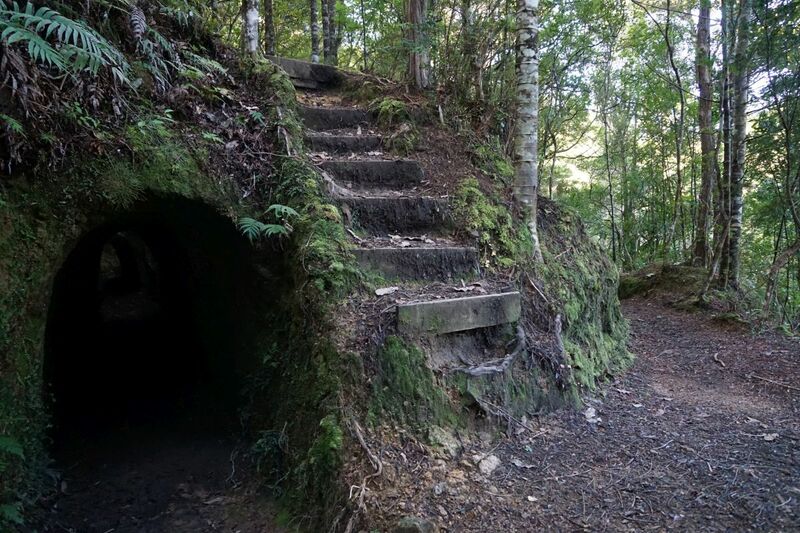 There are 3 short tunnels on the track, none of which requires a torch, and some steeper sections with steps. The track continues where the handrails are visible across the valley by the rocky outcrop. 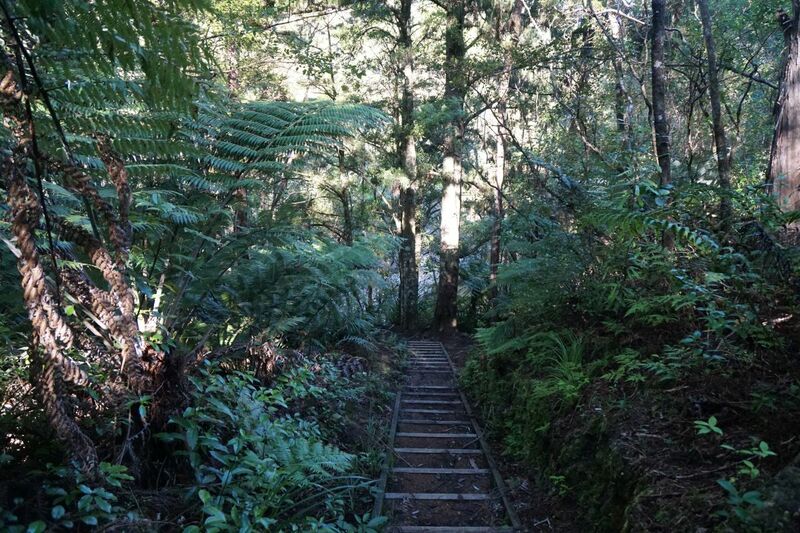 Looking from the steps down the Tairua River towards the campsite and parking area. One of the deepest cuttings for the water race. The race is muddy in many places, but alternative tracks have in some of the worst cases been formed on the embankments alongside the race. There is no alternative route around this cutting. 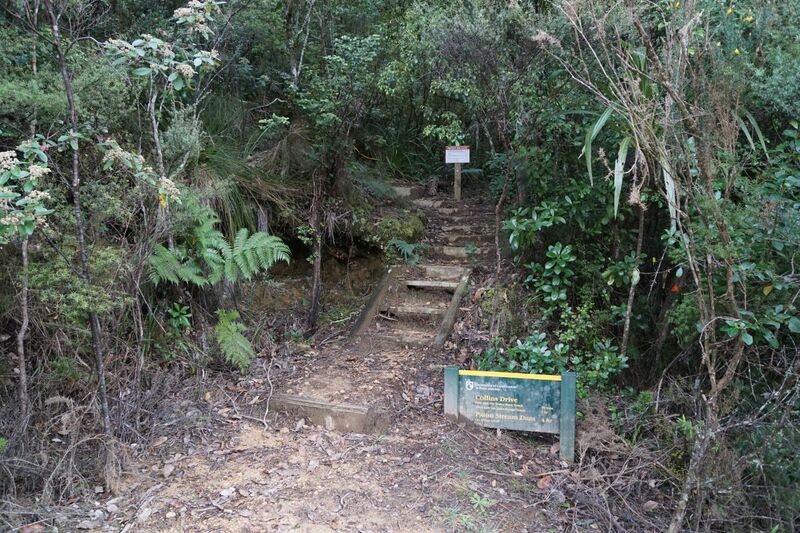 Steps leading up to the first tunnel when heading south along the Water Race Track. The tunnel is short, and the far end is clearly visible when entering the tunnel. 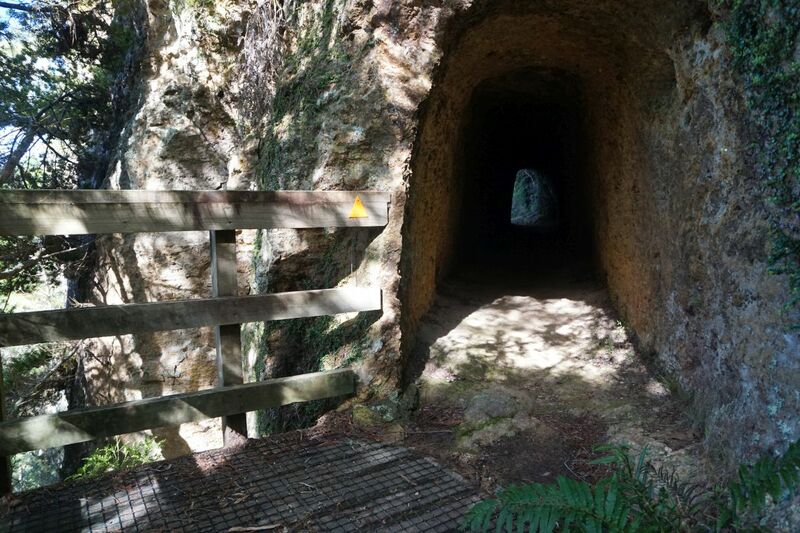 The entry to the second tunnel, with the third one only a few metres further on. The opening at the far end of the third tunnel can clearly be seen from here. There are no signs at the end of the third tunnel where the Water Race Track ends, and it joins with the Water Race Link Track. 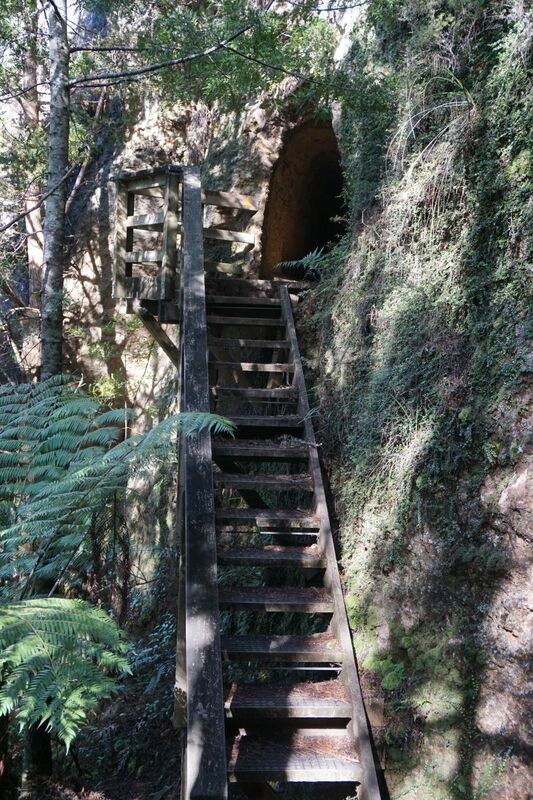 The steps cross over the third tunnel, heading up the hill to the junction with Third Branch Track and the track to the East Entry to Collins Drive. 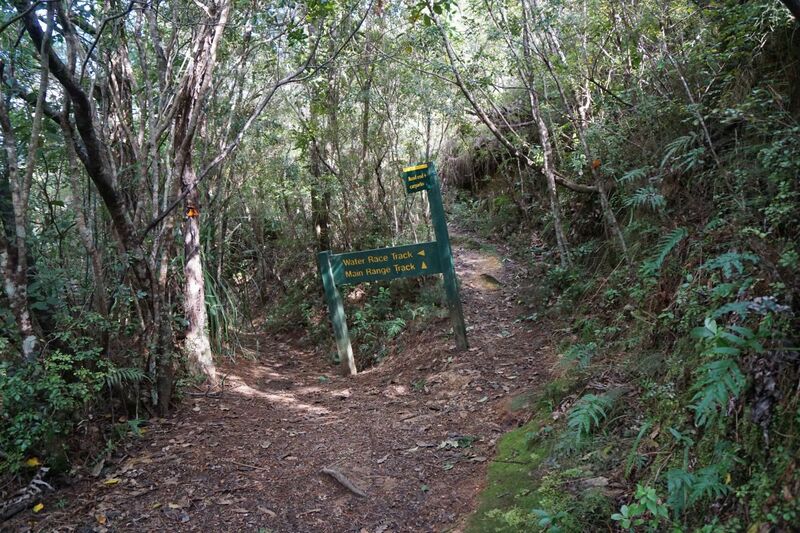 The track to the right continues downhill to the junction with Puketui Walk and the lower end of Third Branch Track. More steps on Water Race Link Track on the way down to the Third Branch Stream. Returning along Puketui Walk to the carpark at the end of Puketui Valley Road. 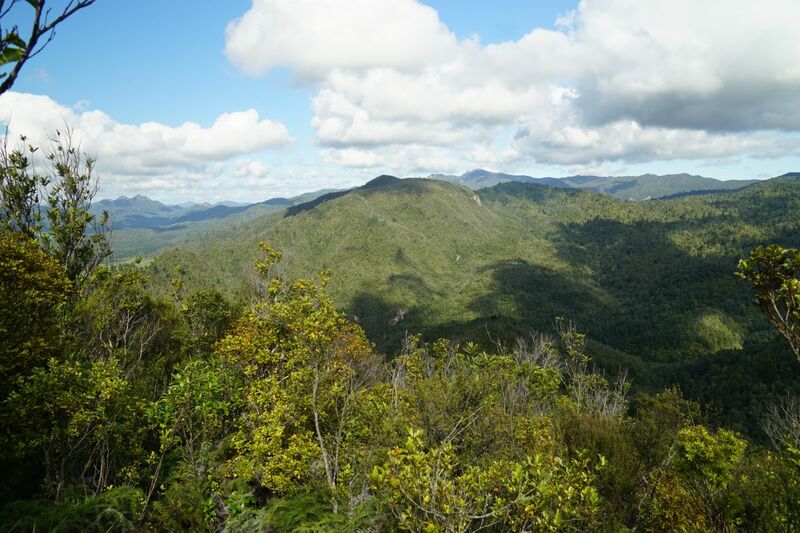 Carpark to lookout via Government Battery and Main Range Track – 55 minutes and 1.7 km. 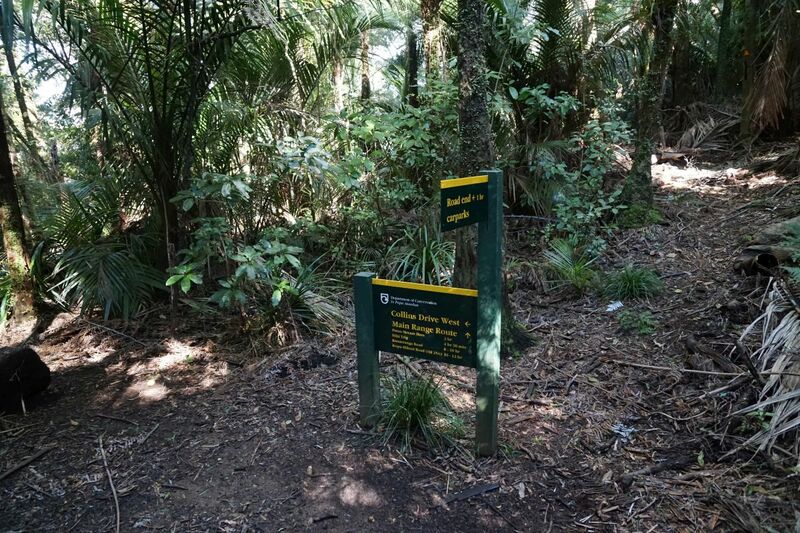 Lookout to Collins Drive West entry – 22 minutes and 500 m.
Collins Drive – 15 minutes and 500 m.
Collins Drive East entry to Puketui Walk via Third Branch Track – 40 minutes and 1.4 km. 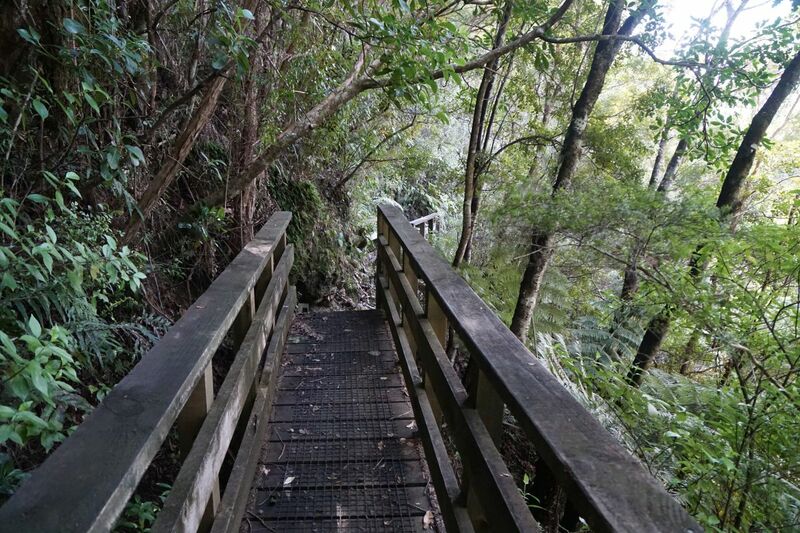 Puketui Walk to Main Range Track – 15 minutes and 750 m.
Water Race Track – 25 minutes and 850 m.
Water Race Link Track in both directions – 25 minutes and 700 m.
Puketui Walk to carpark on Puketui Valley Road – 15 minutes and 900 m.
Total time including short breaks was 3 hours 35 minutes, with a total distance of about 7.2 km. Collins Drive is shown as a straight line as there is no GPS reception inside the tunnel. The tunnel actually curves northwards towards the lookout, as shown in the photo of the map on the information panel. The satellite image from Google Maps covers about the same area as the GPS tracklog. Note the incorrect locations of Puketui Valley Road and Puketui Road. 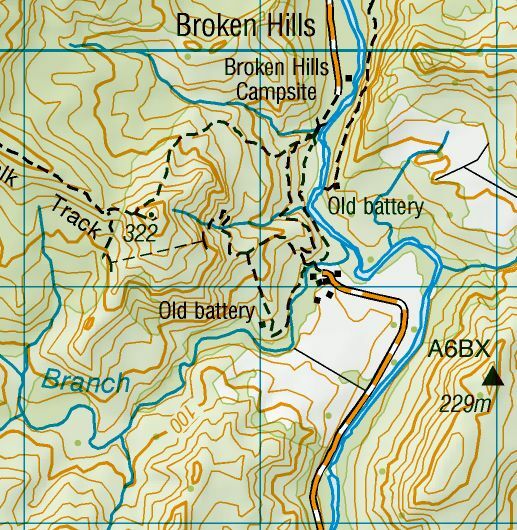 The topographic map shows the location of some of the tracks, and the topography of the area. The locations of the two roads, although not named, are correct on this map. The tracks were walked on August 16, 2016. Love your blog. We publish a magazine and were wondering if we could possibly share some excerpts and photos with our readers.